A magnificent piece of classic Arts and Crafts furniture. 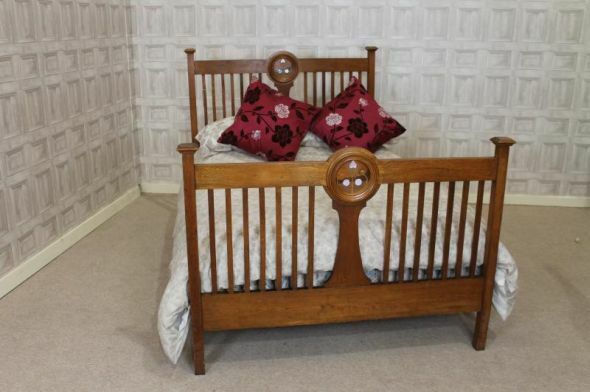 This solid oak arts and crafts bed dates from the late 1900s. The bed features an inlaid headboard and matching footboard. It is finished in a lovely golden oak colour. As you can see, it has a circular inlaid motif and parts of the headboard are inlaid with mother of pearl. Sadly, the mother of pearl on the footboard is missing, but the previous owners have painted this in which blends in quite well. This bed comes with a newly made pine slatted bed base; all that is required is a double mattress.